Coconut oil is a natural oil that can benefit your health. There are many ways you can use coconut oil to improve your skin’s appearance, treat scalp conditions, lose weight, boost your intestinal health, and get rid of fungal infections. It is easy to apply coconut oil directly to your skin, add it to smoothies, or cook with it. In this article, you will learn why coconut oil is good for you and how you can use coconut oil to treat skin ailments, moisturize your skin, and boost your metabolism. Coconut oil is rich in fatty acids which have numerous health benefits. Coconut oil contains medium chain saturated fatty acids, or medium chain triglycerides (MCTs). Almost half of the fat content in coconut oil is lauric acid. In fact, coconut oil is the highest source of lauric acid that occurs naturally. When using coconut oil for its health benefits, it is best to use organic unrefined virgin coconut oil. Virgin coconut oil is less processed than refined coconut oil and therefore contains more nutrients and antimicrobial properties. 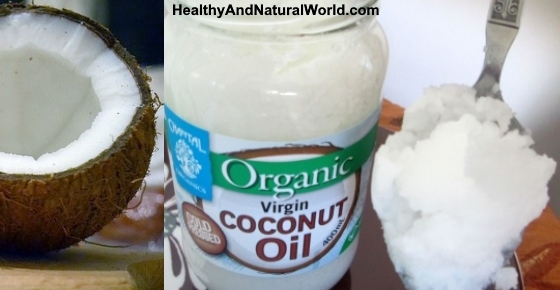 If you are planning to fry with coconut oil, then refined coconut oil may be better for you. The smoke point of unrefined coconut oil is 350 °F (177 °C) whereas refined coconut oil smokes at 450 °F (232 °C). Further reading: Get more information on the differences between refined and virgin coconut oil. Let’s look at how coconut oil can benefit your skin, hair, regulate blood glucose levels, and treat various types of infections. Coconut oil contains saturated fat and because of that, you can cook safely with it at high temperatures. For deep frying, use refined coconut oil as this has a higher smoke point. You can also use it for baking – In fact, it can be used in almost all recipes instead of butter, oils, and other fats. Further reading: Find out how to incorporate more coconut oil into your cooking. The fatty acids in coconut oil cause sustained energy release and enhance energy expenditure. Further reading: Foods that can help to increase your metabolism. It may surprise to you learn that including healthy fats in your diet like coconut oil can actually help you lose weight because consuming MCTs increases satiety. Unrefined coconut oil contains compounds that offer some protection from the sun’s harmful UV rays. You should remember that coconut oil doesn’t protect your skin from all of the harmful effects of UV rays like regular sunblock does. Learn about natural ways to get rid of sunburn and prevent permanent skin damage. The rich fatty acid content in virgin coconut oil means that you can apply coconut oil directly to your skin to hydrate it. Using coconut oil to moisturize your face or treat cracked heels also gives your skin a pleasant coconut scent. you can also combine coconut oil with other natural ingredients for the skin, such as this DIY healing coconut oil and aloe vera gel lotion. Put a small amount of organic unrefined coconut oil on a cotton pad to gently remove eye makeup before going to bed. Find out what other natural moisturizers are good for the area around your eyes. Coconut oil is highly moisturizing and contains antimicrobial properties that make it great for treating inflammatory skin conditions. Further reading: Learn more about why coconut oil is good for treating eczema. The protective effect of coconut oil on your skin can help to reduce the visible signs of aging. All you need to do is apply a little coconut oil to the skin around your eyes, the rest of the face and the back of your hands before going to bed to help prevent fine lines appearing. Find out about more ways to use coconut oil on your face. The rich fatty acid content of coconut oil can also repair abdominal skin that has been damaged as the result of pregnancy or rapid weight loss. Further reading: The most effective ways to get rid of stretch marks naturally. Regularly applying a little coconut oil to skin burns, grazes, or cuts can help wounds heal quicker and prevent secondary skin infections from developing. Even though coconut oil is rich in fatty acids, its antibacterial and anti-inflammatory properties mean that it is a good moisturizer for acne. When using coconut oil to help treat acne, remember that you only need a tiny amount of coconut oil to be an effective acne moisturizer and prevent clogging pores. Further reading: Learn about even more ways to use coconut oil as a natural acne treatment. Since essential oils are very concentrated, you need to add essential oils to a carrier oil to create a soothing, healing massage oil. Although you can use oils like sweet almond oil, olive oil, or grapeseed oil, research shows that coconut oil has many benefits. The antibacterial properties of coconut oil can help to rid your mouth of plaque-forming bacteria and reduce your risk of gum disease. A study from 2016 found that coconut oil was just as effective as chlorhexidine (a skin antiseptic) in killing off strains of Streptococcus mutans. (19) This is the type of bacteria that cause tooth decay and gum disease. Find out how to use coconut oil and baking soda as a natural toothpaste. Further reading: Why you should start oil pulling today. Find out what other foods help to prevent a hormonal imbalance in your body. Consuming coconut oil with your food results in slow-releasing energy that won’t spike your blood glucose levels. There are other foods you can add to your diet that also help prevent blood glucose spikes. Using more coconut oil in your diet can also help to reduce the effects of stress and inflammation in your brain. Further reading: Learn about other foods that may prevent neuro-degenerative diseases. Dabbing a little coconut oil on your lips at the first sign of a cold sore could prevent it from getting worse. The moisturizing content of coconut oil also helps to moisturize chapped lips. Find out other natural treatments for cold sores. Lauric acid in coconut oil helps combat fungal infections and can help to treat candidiasis. Learn how to use coconut oil to treat fungal and yeast infections. The rich fatty acid content in pure coconut oil is effective in treating some bacterial infections. Using more coconut oil in your diet can also help to reduce the effects of inflammation. Further reading: Learn about foods that can help to reduce inflammation. The anti-inflammatory and analgesic effect of consuming coconut oil can also help to manage painful symptoms of arthritis. Further reading: The best foods to eat and to avoid to reduce inflammation in arthritis sufferers. Applying pure coconut oil can help to moisturize your scalp and keep it free from dandruff. Further reading: Find out how to use coconut oil for great hair and skin. Using coconut oil as a leave-in conditioner can help to strengthen your hair and may even prevent hair loss. You can find out how to make your own coconut oil hair growth remedy using rosemary essential oil. If you have dry, brittle hair, you can use coconut oil on your hair to improve its appearance and give your hair luster. Further reading: How to use coconut oil as a hair conditioner and moisturizer. The effect of coconut oil on your metabolism can also help to reduce your waistline and lose fat from your abdominal region. Find more information on how to lose your belly without counting calories or starving yourself in my e-book Blast Your Belly Fat – this is the ultimate guide for losing belly fat. Consuming coconut oil regularly in your diet is good to strengthen your bones and prevent damage to bone cells. The antioxidant and anti-inflammatory effect of coconut oil may also have a positive impact on the health of your liver. Further reading: The best foods & herbs to cleanse your liver. If you do get bitten by an insect, you could apply a little coconut oil to the itchy bump to relieve itching and redness. Further reading: How to repel bed bugs using natural ingredients. Find about what else you can do to treat head lice without using toxic chemicals. The antibacterial properties in coconut oil mean that it can protect your underarm area from smelling of sweat. You can combine coconut oil with other natural ingredients to boost its deodorizing power. For example, baking soda and tea tree oil have an antibacterial effect that can keep your underarm fresh without dangerous chemicals. Learn other ways to make your own natural deodorant at home. The health benefits of coconut oil for humans have been well documented. However, not everyone knows about the health benefits of coconut oil for dogs and cats. Ingesting coconut oil can make your pet’s fur shiny, and can improve your pet’s general health. You can also apply it topically on your pet’s skin to relieve itchy or dry skin or to soothe flea bites, as well as on minor cuts and wounds to help prevent infections. Further reading: Coconut oil for dogs, cats and other pets – The ultimate guide. One way to increase the amount of coconut you use in your diet is to make your own coconut butter. Coconut butter contains all of the goodness that coconut oil has along with fiber that can help improve your digestive health. All you have to do is put coconut flakes into your food processor or blender and blend until they become creamy smooth. After you have made your delicious healthy coconut butter, you can add it to smoothies, spread it on toast, or add it to give your curries a delicious coconut taste. Put coconut flakes in a high powered blender or food processor and blend on medium until they start to get creamy. Turn to high setting until you have a smooth butter. For an extra smooth coconut butter, process through a fine mesh sieve. Coconut butter doesn’t have to be refrigerated and lasts a very long time. I love coconut oil, I use it for oil pulling, and for many other things mentioned here, but I am worried about something, I has blood test done and had a 229 trigliceride result. I was using coconut oil for weightloss, but now I dont know.. Can anyone tell me if its safe to keep using coconut oil, or was this the cause for my 229 trigliceride result? Hi Evy, you can refer to my article about coconut oil for weight loss and the recommended dosage which is 1-2 tablespoons. According to the American Heart Association, coconut oil may contribute to elevated triglyceride levels, so should be consumed in moderation. You may want to check other contributors in your diet to higher triglyceride levels like other fats and sugars and reducing alcohol intake. Triglycerides can also become elevated as a reaction to having a health problem such as diabetes, hypothyroidism, or kidney disease. Also some people have a genetic predisposition that causes them to produce too much triglycerides no matter how carefully they eat. As soon as I felt a cold sore coming on I rubbed it all over my lips and an hour later the symptoms stopped. Such great information. This is a keeper.